I’ve never lost any camera equipment or had it stolen but I can imagine that it’s an unpleasant experience. 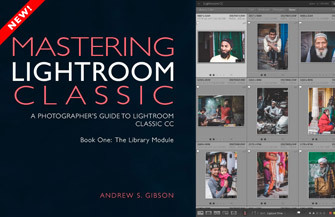 This is something that I’ve been thinking about recently as I decide what to take with me on our upcoming photo tour to Rajasthan, India. It’s not a hotspot for theft, but it’s still sensible to take precautions to protect our gear. Fortunately, there are easy steps you can take to protect your cameras and lenses from theft. You should also register your gear for free with the Lenstag website to maximize the chance of recovery if you are the victim of a robbery. First, let’s look at how you can minimize the risk of camera theft. An infographic published by Lenstag reveals that the most common places to have camera gear stolen from are cars (31%) and the home (20%), followed by public transport (10%) and street robberies (8%). It also lists the three countries (United States, UK and Italy) and the three cities (Rome, London and Melbourne) with the highest incidence of theft. These figures tell us that the most likely place to have your gear stolen is from your car. It should be common sense never to leave your gear on display. Locked in the trunk / boot, out of sight is best. Personally, I prefer to keep my camera gear with me. That means making sure I don’t have more than I can comfortably carry. But I appreciate that this is difficult for those of you who are into wildlife or sports photography, or professionals who need to take lots of gear with them. If you must leave stuff in your car make sure it’s properly insured in case the worse does happen. I know a photographer who had his camera gear stolen during a burglary that happened while he was in the house, asleep. His cameras and lenses were in a camera bag on the ground floor, and the thief took them. The lesson here is that camera bags make it easy for burglars to steal your gear. Apart from the usual home security measures, the best idea I’ve heard to keep your camera gear secure is to buy an office safe and lock your cameras and lenses inside it. It’s also a good place to keep a hard drive with a backup of your photos, Lightroom Catalog and other important files. You can even buy fireproof safes that offer an extra degree of protection. Another idea is to use a Pacsafe product such as the C35L anti-theft bag protector to secure your bag to a fixture that isn’t easily removed (this is a good tip for traveling and I’ll be taking mine with me to India). Alternatively you can attach your camera bag to a fixture using a cable and combination lock (again, also useful when traveling). There are also things that you can do when you’re out and about to reduce the risk of theft. The relevance of these tips will depend on which country you live in or intend to travel to, as some places have a higher risk of mugging type theft, where others you are most likely to have your gear stolen by thieves when you’re not paying attention. If you put your camera bag down somewhere, for example in a restaurant or cafe, use a carabiner or a lock and chain to secure it to a table or chair. This helps prevent someone snatching it while you’re not looking. Thieves can be clever. I know another photographer who had a camera bag stolen in a restaurant in Italy even though it between the back of his chair and the wall. Don’t let this happen to you. In the comments to the article linked above (here’s the link again) someone tells a story about a camera bag that was stolen from underneath a table during a meal. Don’t walk around with a big camera or lens if you’re in a city known for high incidents of theft. This video taken in St Petersburg, Russia, shows what can happen. The photographer was surrounded by a group of people who distracted him while one of them removed the lens from his camera. This video shows a similar scam, this time in laid-back Edinburgh. It’s a BBC documentary made to show how easy it is for thieves to distract a victim and steal lenses by removing them from the camera. You’ll notice that there was one person they couldn’t rob because he kept his hand on his camera while speaking to the scammers – this shows how good awareness of your environment can help deter theft. I’d also suggest keeping your camera in a camera bag, rather than on a strap around your neck. Messenger style bags are good because you can easily protect them with your arm or swing them around in front of you if you are unsure about your environment. Also consider hiding brand names with black tape, to make your camera look older or more knocked about than it really is. If you want to have your camera ready to take photos, then keep it in your hand, with the strap wrapped around your wrist (or use a wrist-strap). Smaller cameras are easier to use in this respect. But there’s another advantage to using smaller cameras. People often equate size with expense, and may not think a small camera or lens is worth stealing. If you are traveling to a city with a reputation for street theft, consider buying a small mirrorless camera (such as the micro-four thirds models made by Olympus and Panasonic) or a high end compact especially for the trip. These are easy to slip into an internal pocket or a bag when not in use. Be aware when people are within an arm’s length of you – because this is the only time when it’s possible to steal your gear covertly. Step away, if you can (not always possible in a crowd), and be aware of where your gear is. All these points made, I don’t want to scare people. I have traveled a lot (over 70 countries) and have felt very safe in most of those places. I never felt in danger of being robbed in London or Barcelona, despite the relatively high risk of street theft in the latter. Camera insurance is a good idea, just in case the worse happens. Make sure that your gear is covered by your policy, especially if you are relying on household insurance (which probably doesn’t cover gear used commercially – a caveat that may apply even if you only make a few dollars from your work). Be wise, but not so paranoid or overcautious that you can’t enjoy yourself. If you’re away from home it’s a good idea to back up your photos from your memory cards to another device, in case they are lost or stolen. Keep your memory cards on you, and the backup in your hotel room. Potential backup devices are laptop computers, netbooks or tablets with plenty of storage space like the 64GB and 128GB iPads and iPad Minis. Again, just like big lenses, MacBooks may be more tempting to thieves than cheaper netbooks. 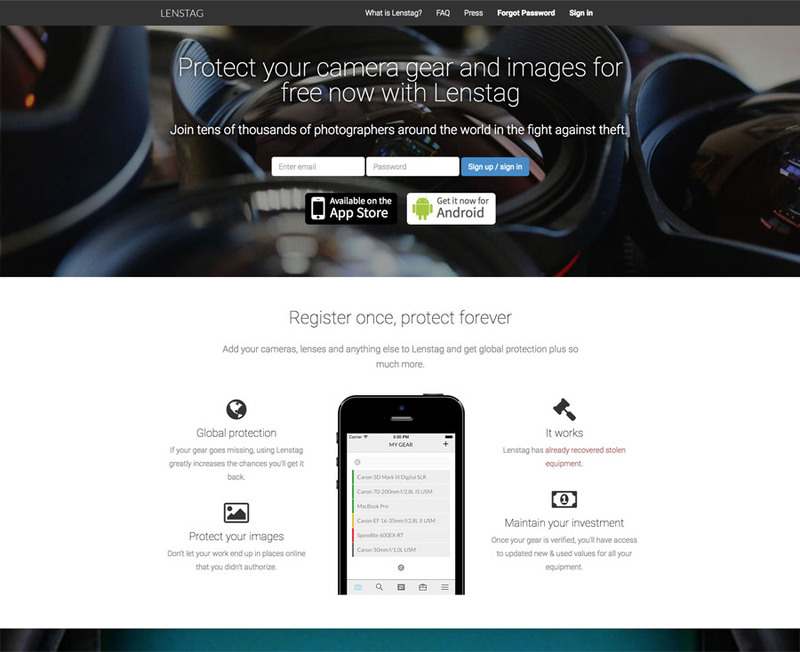 Another step you can take is to register your gear with Lenstag (this is free). The website stores the details of your camera gear, plus serial numbers, in a database. If your gear is stolen, you can flag it on the website or in the app. 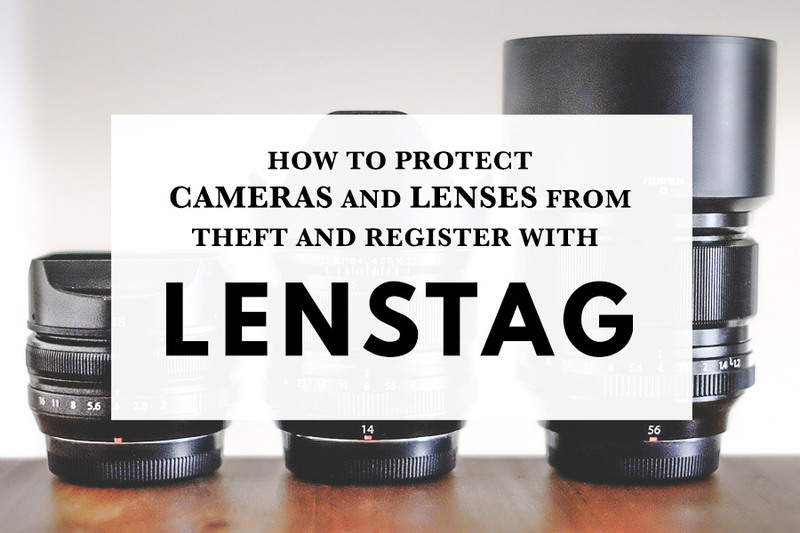 If the thief tries to sell the gear to a dealer or buyer who checks serial numbers with Lenstag, they will see straight away that the goods are stolen. Even if it doesn’t lead to the recovery of your lost gear, it will make the job of selling your stolen property on much more difficult. As Lenstag is free I strongly recommend you use it. If nothing else it’s handy to have a record of all your equipment in one place along with the serial numbers. You never know when you may need it for insurance or inventory purposes. The Lenstag website is checked by camera and lens rentals companies like BorrowLenses, LensProToGo and LensRentals in North America, and hopefully by dealers all around the world. 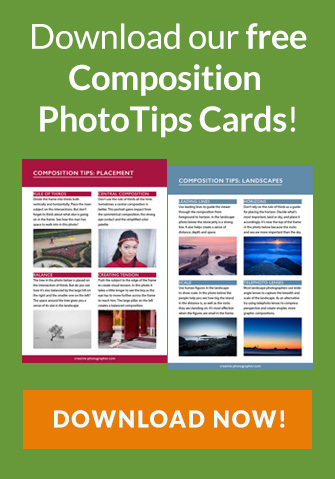 As more photographers upload their details it will become even more useful. Hopefully it will becomes standard practice for anybody buying second hand gear to check with Lenstag to see if it’s stolen. The are also free Android and iOS Lenstag apps that you can download for checking the database (or marking items as stolen) on the go. You may be aware that the serial number of your camera and lens are stored in the EXIF data of the photos taken with it. The Lenstag Rescue Chrome extension checks the EXIF data of photos on websites browsed by people who have the extension installed in their Chrome browsers. If this includes photos taken with your gear, it shows up when you log into your Lenstag account. This is a very good idea that may help find the person using a stolen camera or lens – at least one thief has been caught because of this already (see link below). It will also inform you if someone has copied one of your photos and used it on their website. Using Lenstag is simple. All you do is sign up for a free account, then enter the model and serial number of each piece of gear you want to register. The final step is verification – you need to take a photo of each item that includes the serial number and upload it to Lenstag. This verifies that you are indeed the genuine owner of the registered gear. Lenstag isn’t just for cameras and lenses. You can register any photographic accessory with a serial number, including tripods, camera bags, batteries and memory cards. If your item doesn’t have a serial number, you can even create one yourself using a permanent marker or engraver. You can also register other types of devices, as long as they have a unique serial number or other type of identifier. If you’re unsure where to find the serial numbers on your gear then this Lenstag article will help. Lenstag can also generate a verified link that you can add to online adverts so that buyers know you are the rightful owner of your equipment. Only sellers who have verified their ownership with a photo of the serial number can do this. And yes, Lenstag really works. You can read about a couple of success stories here and here. In the first, someone purchased a lens that he later realized had been stolen, and returned it to its owner. And in the second the photographer found his stolen camera after Lenstag found a photo taken with it on 500px. These articles on the Lenstag blog go into the topic of camera security in more detail. 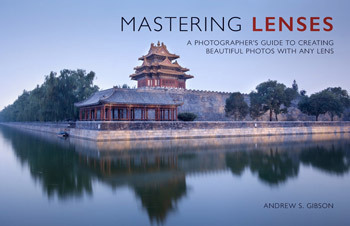 Learn how to take beautiful photos using any lens with our popular ebook Mastering Lenses. The lens buying guide alone could save you hundreds of dollars on your next lens purchase!